Life is crazy, right? There’s moving, job changes, babies, weddings, divorces, health complications, weather disasters, and (okay, I’ll stop listing all these crazy life changes. You get the point.) Life is fun, but it can get complicated. Working full time while writing is hard enough, but what do you do when you’re also coping with a life change? You could curl up at your desk and cry…(which, totally valid)…or you could try these tips below. To be honest, the answer to this question is going to be different for everyone. But I’m actually going through this right now. I just began a new job at the library, so my hours are totally different than what I’ve been used to for the past three years. Even my sleep schedule has changed, dramatically, and adjusting to my new way of living while trying to keep up with my writing goals is a little difficult. So here are some quick tips I’ve learned by going through this. If you’re not on a serious deadline, try to give yourself time to adjust to your new situation. In my case, that meant relaxing when I got home from work (even if it was a super short shift) and only writing on my days off. Slowly, I started to write after or before work too, but to be honest, I’m still adjusting to my new schedule, and my new job has to come first right now. Remember: writing isn’t a race. Start slowly. Getting burnout is the last thing you need, both for your new life change and your writing life. If you’re on a deadline though, you probably don’t have this luxury. In that case, I suggest as much sleep as you can get and, if possible, support from friends and family. Ex. If you’re moving, try to see if you can get a buddy to unbox a few things for you while you write. Pay them with pizza. Heck, hang out with them for five minutes if you can. You still deserve a little time to de-stress. Clearing your mind will help you hit those goals more than pushing yourself too hard all the time. If your stress levels are too high to write, binge-read all the books you’ve missed out on. Breathe. Adjusting to something is HARD. The last thing you need to do is be any more hard on yourself than life already is. If you struggle with writers block because of the change, take a bigger break or write anyway (and don’t judge yourself when you hate what you wrote. You might find out when you read it later on that it wasn’t so bad after all). Remind yourself why you love writing and that this is a temporary feeling. You will adjust. Reward yourself for the little things (because those little, first steps can feel huge). For instance, on my old schedule, I tended to write 10,000 words per week pretty easily, but lately, I’ve been managing about 5,000, and that’s okay. I’m just glad that I’m still figuring out when and how I can write, so that I can continue more in the future. So these are my tips! If you’re currently going through a life change, I hope these help you write well and feel good about writing again. Challenging your writing is important, but what does that mean? I mainly write YA SFF, and I have done so for ten years now, but recently, I set out to write a historical novel. Not only that, but it is my first serious project written in third person. Why? Because I’m challenging my writing…and myself. Challenge: Try a new utensil. If you normally type your books, try a pencil. See if that changes your perspective. You see, I’m comfortable with first-person science fiction and fantasy. Almost too comfortable. I find myself flying through drafts and ideas—and I love that, don’t get me wrong—but I can’t help but feel like I’m missing something more. A hurdle. A bit of fear. A semblance of discovery. By challenging myself, I can learn more. I might even fall in love with a new style, genre, or voice. The possibilities are endless. It’s easy to write with your strengths, but what about overcoming your writing weaknesses? I struggle with romance, for instance. Though I love first-person, I find it a bit narcissistic, so concentrating on feelings on top of the I, we, me, etc. has always been uncomfortable for me. So, I thought, What about third person? I had no idea if third person would help me overcome this hurdle or not, but hey, I set out to try…and sure enough, I learned a lot about myself and about writing those more emotional scenes. In fact, I look forward to learning even more about my writing through this challenge, and I look forward to future challenges I set out to overcome. Granted, challenges come with…well, challenges. Normally, I would be 60,000 words into this first draft, but I’m currently sitting at 42,000…and it’s a messy 42,000. (A really messy 42,000.) But I’m also in love with the mess. I have never been so unsure of my writing in my life, but I still believe in the manuscript. I still believe in the challenge. And even if I never finish this book, I already succeeded at reaching my original goal: Learning something new. Constantly challenging myself helps me learn more about my writing and about myself. So I challenge you to set a challenge for yourself today. Try a new genre. Write from a new type of character’s perspective. Attempt a different perspective entirely. Just go on an adventure. Make mistakes. Overcome obstacles. Try again. You might discover something amazing. But how does someone make more time to write? Sounds simple, right? But we all know it isn’t. But here’s the truth: You CAN change your schedule…and it might be a little uncomfortable at first. You also might have to change it more than once to find that extra timeslot that works for you. Recently, I wanted to meet a deadline early, but I knew I didn’t have enough time in my day to do so. In fact, I rarely write every day. My full-time job on the computer often leaves me exhausted and, quite frankly, sick of staring at a computer screen. Add carpal tunnel, and, well, it gets easy to say no to writing after work. But I knew that was my weak point, so I started there. I set my goal: Wake up an hour early every day just to write. Before emails. Before social media. Before work. Before everything. Just an hour to write. The first three days were awesome. Granted, I started my goal on a weekend. That way, I was still rewarded with a little extra sleep. But then the workweek came. Holy hell. The first day wasn’t bad, but the second? UGH. The fifth day was probably the worst day, though the sixth day had me wondering if I really wanted to do this. At one point, I actually wrote less than my usual amount, because I was too tired to concentrate. Then, the seventh day came, and I adjusted much faster that morning. Now, it’s routine. After I adjusted, I definitely reached my goals and wrote more than I expected. (I added an extra hour of writing time, after all.) I’m still getting up an hour early every day, and so far, so good. I don’t feel any more tired than I used to, and I’m more productive than I was before. I mainly attribute this to the fact that I start my day with writing. Even though I’m not a morning person, it’s easy to get bogged down by the day, but if I start writing before all of that pressure puts me down, I can write without worry, without distraction, and without the world of work life. Granted, I’m not telling everyone to do what I did. Your goals are going to be different than mine, because your life is different than mine. But I promise you, you can find more time without a Time-Turner. So, here are three additional tips. 2. Make smaller goals within your larger ones. Having a goal beyond “I just want to write more” helped me push myself to reach expectations. I had a deadline. This smaller goal helped me stay focused on something specific and attainable. If you go in thinking you’re changing your life, it might make you feel overwhelmed, but if you go in thinking you’re trying to change your week, it will feel reachable. 3. Tough out your new schedule. As you saw above, I had ups and downs. I had mornings I questioned myself, and plenty of times I wanted to stay in bed, but I didn’t. I forced myself to get up again and again, and eventually, I adjusted. Personally, I suggest toughing out your schedule for at least two weeks to see if you can adjust to it. If you can’t, try another adjustment. Changing anything in your life isn’t easy, but having more time to write? This may be personal in regards to my writing life, but I’d be surprised if it were unique to me. During and right after a book release, it’s difficult for me to write. Not because I don’t want to, but because I end up spending hours upon hours on Luna-P (a.k.a. my lappy toppy) for interviews, guest posts, and social media in general (all of which I love, but it results in some sore eyes). So, for a little while after releases, I’m in a limbo period. What is a limbo period? Well, for me, it’s just Dante’s way of saying I’m in wait. I’m not writing right now; I’m simply waiting for the right time to write again. I’m resting, so to speak. I’ve seen a few people call this writer’s block, but I want to clarify that it isn’t writer’s block, because I could write. (And, as you’ll see below when I talk about what I’ve been doing, you’ll see, in fact, I do write sometimes.) But it’s more like a mental vacation to regain energy and focus. Maybe I’m the only one who does this…but I doubt it. We all need rest, after all, and I’m still productive during this limbo time. 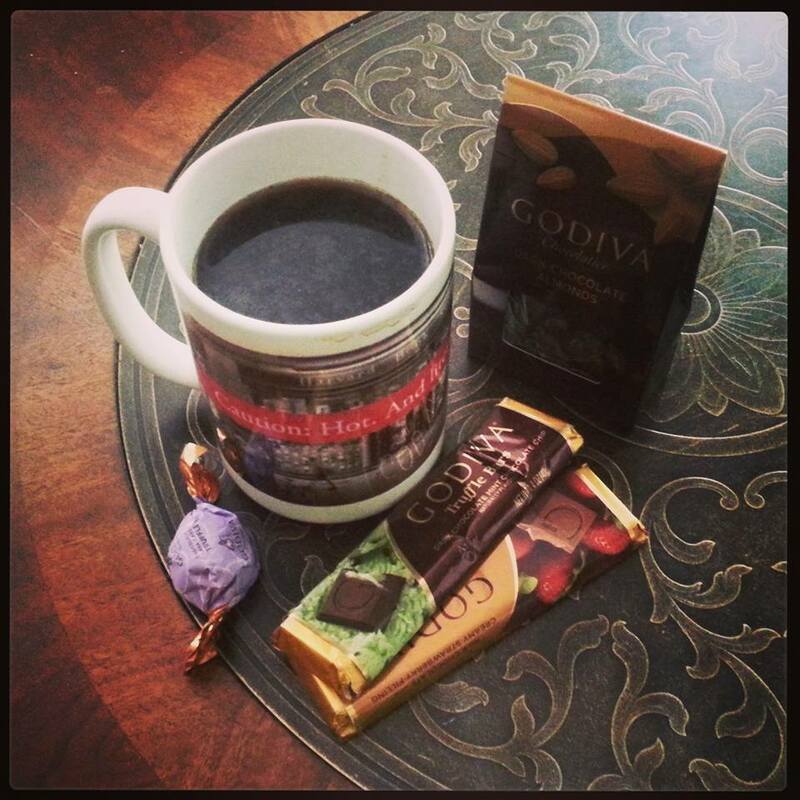 Coffee and chocolate helps limbo too! What do I do during the limbo? I mainly analyze where I’m at and where I want to go. Ex. What novel do I want to release next? What about books after that? What do I want to do differently with that novel? Covers? Events? Local events? Traveling? I’m currently in this writing limbo phase. Since Minutes Before Sunset and Seconds Before Sunrise have released during the past two months—not to mention Death Before Daylight releasing on September 15—I’ve basically been in limbo for a little while now. And I’ve been enjoying it. While I did complete the rewrite of November Snow—See? You can write during limbo—I have focused a lot of my energy on where I’m going next. For instance, I want to release November Snow next. Then, I think I’ll return to The Tomo Trilogy (good news for you Take Me Tomorrow fans!) In fact, I was analyzing the sequel, Take Me Yesterday, just other night. I also want to try to get more swag for readers and hold two to three local events this fall for the paranormal season. I think it’d also be nice to offer signed box sets of The Timely Death Trilogy this October. So, look out for that. I’ve even taken some time to think over my blogging plan, and I might talk about this more in the future, but I’ll probably be ending guest posts in November (so now is the time to submit at shannonathompson@aol.com). I plan on using the Monday slot for old posts (we’re talking two-year-old blog posts) that were really popular, but are in need of a rewrite. I’m planning and plotting—and not just books—and I’m having a great time. Limbo doesn’t have to be a scary place, or an unproductive place, or a place of worry. It can be saved. In fact, it can be looked forward to. It can even take you places. In other news, the Seconds Before Sunrise blog tour is underway. Most recently, we were on Just Amy for a spotlight, but I’ll share more interviews and such soon. 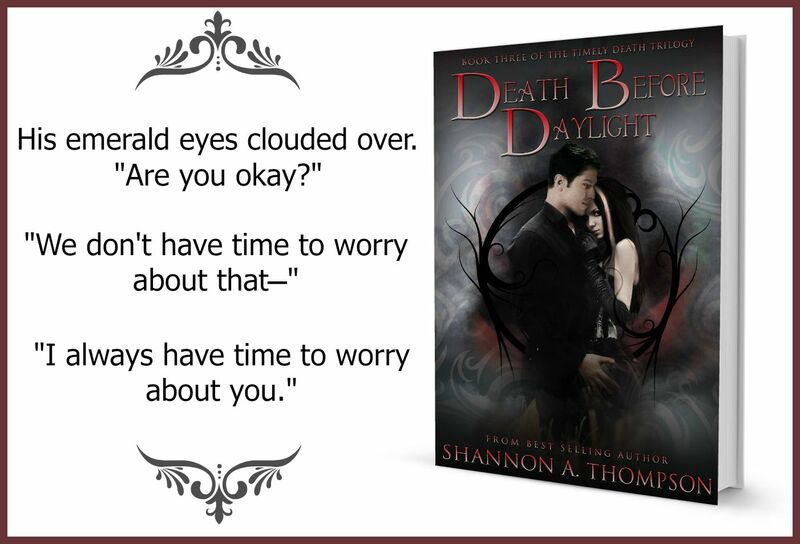 If you want to participate in the release day blast for Death Before Daylight, sign up here. On September 18, Clean Teen Publishing will be hosting an event on Facebook from 7-9 p.m. (EDT) to celebrate the release. I’ll be there and giving away a TON of Dark prizes, so feel free to join us by clicking here. But there are more events to come! Keep an eye out.